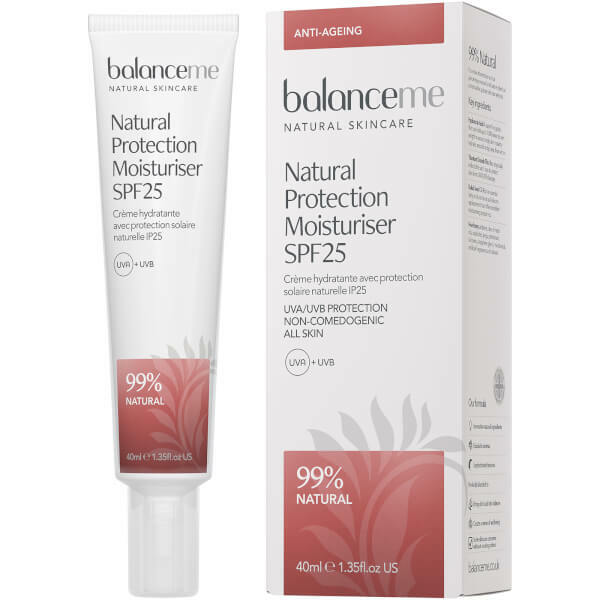 Shield your complexion with Balance Me's Natural Protection Daily Moisturiser SPF 25; a lightweight, anti-ageing cream that works to protect and hydrate skin without greasy residue. 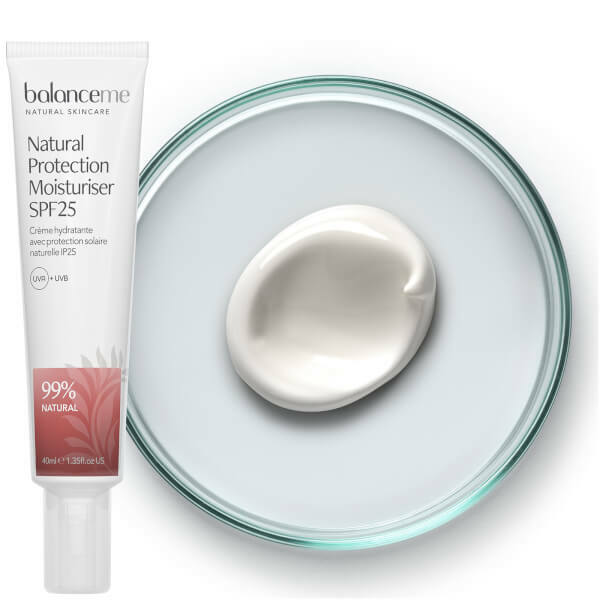 Harnessing the powers of Hyaluronic Acid and antioxidant-rich Blackberry Leaf Extract, the quick-absorbing formula delivers instant, long-lasting hydration, whilst natural mineral filters defend against harmful UVA and UVB rays. Helps to minimise the appearance of fine lines, wrinkles and pigmentation for a smooth, youthful-looking complexion. 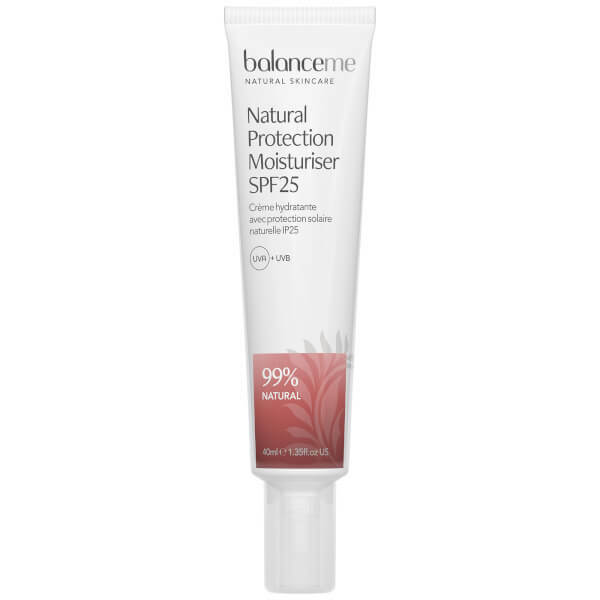 Suitable for all skin types, including sensitive, it can be worn alone or as an extra layer of protection over regular face cream. Apply a layer of cream onto a cleansed face in the morning either on its own, over your regular daily moisturiser or under foundation. Aqua (Water), Caprylic/Capric Triglyceride, Titanium Dioxide, Cetyl Ricinoleate, Coco-Caprylate, Sorbitan Isostearate, Polyglyceryl-2 Dipolyhydroxystearate, Glycerin (Vegetable), Alumina, Stearic Acid, Cellulose, Polyglyceryl-3 Diisostearate, Hydrolyzed Hyaluronic Acid, Sodium Hyaluronate, Rubus Fruticosus (Blackberry) Leaf Extract, Aleurites Moluccana (Kukui) Seed Oil, Camellia Oleifera (Camellia) Seed Oil, Crambe Abyssinica (Abyssinian) Seed Oil, Rosa Canina (Rosehip) Fruit Oil, Anthemis Nobilis (Roman Chamomile) Flower Oil¹, Citrus Aurantium Bergamia (Bergamot) Fruit Oil¹, Agonis Fragrans (Fragonia) Branch/Leaf Oil¹, Salvia Sclarea (Clary Sage) Flower Oil¹, Boswellia Carterii (Frankincense) Gum Oil¹, Lavandula Angustifolia (Lavender) Flower Oil¹, Aloe Barbadensis (Aloe Vera) Leaf Extract³, Tocopherol (Vitamin E), Rosmarinus Officinalis (Rosemary) Extract, Helianthus Annuus (Sunflower) Seed Oil, Glucose, Sodium Chloride, Glucose Oxidase, Potassium Iodide, Potassium Thiocyanate, Lactoperoxidase, Bisabolol, Maltodextrin, Distarch Phosphate, Limonene², Linalool², Geraniol², Citral². (¹) natural pure essential oil, (²) naturally occurring in essential oils, (³) certified organic ingredient.